Now I appeal to you brothers and sisters by the name of our Lord Jesus Christ, that all of you be in agreement and that there be no divisions among you, but that you be united in the same mind and same purpose. For it has been reported to me (by Chloe’s people) that there are quarrels among you, my brothers and sisters. What I mean is that each of you says, “I belong to Paul,,” or “I belong to Apollos,”or “I belong to Cephas,” or “I belong to Christ.” Has Christ been divided? Paul understood what Jesus was asking his Father and what he was asking of us at Jesus’ last meal with his disciples…those who would come after him and who would learn better through these who would become the first teachers, the first evangelizers. Through us, even after all these centuries. 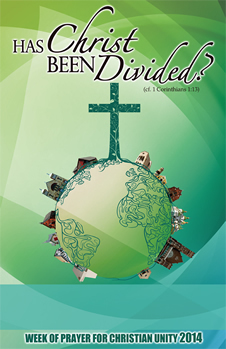 The theme from 1Corinthians 1:13 for our 2014 Week of Prayer for Christian Unity was chosen by the Ecumenical Committee of the Churches of Canada. Canada, which has such diversity of cultures, religious traditions and practices, as does the United Sates and every other nation in the world these days, has chosen well Paul’s first letter to his dear sisters and brothers in Corinth. Faith and Order Commissions have much to do everywhere. Does diversity mean division? Has Christ been divided? I am not asking you take them out of the world, but I ask you to protect them from the evil one….I ask not only on behalf of these but also on behalf of those who will believe in me through their word, that they all may be one. As you, Father, are in me. How else is the world to know that God truly sent his son to let us, his followers, his disciples, his evangelizers know how much God loves us and how, as his followers show our love of God by the way we love and relate with each other? There is no other way but how we relate…interrelate… with each other? We are among those who have come to believe through those first followers of Jesus. We have become, we pray, the bringers of the Good News, evangelists of Jesus, who is not divided. As Christians, we certainly want to respond with a resounding “no” to this question of Christ being divided. However, we must also give a resounding “yes” to the fact that we, Jesus’ followers, his evangelists, bearers of the “Good News” have been and still are, divided! Jesus prayed for our unity at his “Last Supper” because he already knew how we would be individually and communally. Answering Paul’s question points in reality to our own disunity. Even a few years ago, even some planners of the Week of Prayer for Christian Unity asked why special place was given to Reverend Dr. King, Jr, in the middle of the “main event”, namely the Week of Prayer, when Dr. King already had “a day of his own.” We are acting in the same way, today. Exclusion is still one of the orders of the day. There is as well the racism, classism, pride of place, etc. Paul, in writing to his “beloved brothers and sisters” might well have been writing, as did Martin Luther King, Jr, to his “Beloved Community”…his brothers and sisters in the Lord. St. Paul wanted to avoid factions. The term, “Beloved Community” was first used in the early 20th Century by Josiah Royce, the philosopher-theologian who founded the Fellowship of Reconciliation. Dr. Martin Luther King, Jr., also a member of the Fellowship of Reconciliation, made the term more popular and gave it a deeper meaning affecting people of good will all over the world. If ever there needs to be what is now being called the New evangelization now is the time! Aren’t we evangelists supposed to be concerned with the way we treat our fellow brothers and sisters and that we show our love for God our creator, savior and spiritual guide? I had considered using the subtitle, “Cry the Beloved Community”, after that famous book by South African Alan Paton, Cry the Beloved Country. However, my dear friend and colleague, Reverend Dr. Angelique Walker-Smith recalled to me that while Cry the Beloved Country is known by many African and African American brothers and sisters, this book is not widely known outside the Black Community. I reconsidered but highly recommend the reading of this classic book, Cry the Beloved Country. For those not familiar with the book it is about two South African Episcopal priests, one Black and one White, and terrible events surrounding the lives of their sons. When the question was posed, as to why Alan Paton chose this title one explanation was that South Africa at that time was facing a lot of problems and so the country had to cry so that it could be heard in order for the world, including the church, to see the problems, face them and try to restore justice and reconciliation so badly needed. We know the changes that have taken place in South Africa now, but Cry the Beloved Country is still worth the read. Can it be that the divisions and disputes that Paul is writing his brothers and sisters about are the same as we are still experiencing…suffering…today? Favoritism and boldly stating to whom they “belonged” …for whatever reason…because probably of what Paul, Apollos, etc. believed and lived thereby teaching the followers to live and behave in the same matter. There was probably, pride of place and station, classism, etc. There certainly must have been racism because we have the words about slaves being obedient to their “masters”. Still we have not learned how to live well with each other. How to accept our diversity. But God still lets it be! It is not Jesus Christ the second person of the Trinity who is divided. It is us, and there is of course nothing wrong with the diversity. It is how we live with it and try to make it a whole…to integrate it in order to show the beauty and diverse attributes of our Trinitarian God. There is but one body and many parts; there are many gifts but one Spirit. Paul asks, in his usual manner…rhetorically…so that we would, think, pray and finally come to understand that Christ is not divided. It is our lot to seek the unity which Jesus the Christ desires of us and wants us to live for. Just a short few years ago some planners asked why the homily for Reverend Dr.King, Jr. is still inserted in the middle of the planning for the Week of Prayer for Christian Unity. If there is any more proof that prejudice, racism still exists among Christians, this query is proof that. Martin Luther King, Jr. is the Inheritor of the tradition of Paul. We are of the same tradition. We are to be the evangelizers in God’s world today to pass on the “Good News” which Jesus came to tell us. This is not a theological treatise but rather a writing which hopefully as an evangelist, myself, who has learned through the teachings passed on to me. So that I can help in some way to pass on the “Good News” which Jesus came to tell us. Which Jesus told us how we are to live and be with each other so that the world…even unbelievers… live to show that God truly did send his son and that our way of being with each other will show the world what God wants of us. As St. Paul wrote to his devoted followers, Martin Luther King, Jr. wrote to and for his followers whom he considered not followers but co-workers. What Paul wrote to his Corinthinians might be comparable to Martin’s writings to the “Beloved Community”. So as we think and pray about our divisions … not Christ’s being divided, we see the similarities in the two men looking at the wholeness of Jesus and the attempt of us as we continue our prayer for unity because we are aiming at that integrated-ness, that integrity, that unity for which Christ prayed and asked us to pray and work for. As he was not and is not and never shall be divided, he however knew we would be and he wanted us to live in the harmony as community, as brothers and sisters, so that unity which would prove that it was from God that he came to us. What else can prove to the world …to all humanity…that God sent his only son to show his creatures how to dwell in peace with each other? Can it be that when the day comes when all the world and humanity can dwell in peace and harmony that God will come to us with that great cloud of witnesses who had tried with all their might and with their faith and hope and love and mercy and justice to live as Jesus showed us that God will come? May we, too, inherit the mantle of evangelization from both Paul and Martin to help eradicate injustice, pride, prejudice, racism and the other evils in the world so that we may live for peace, justice and reconciliation so the world may see in our unity as true brothers and sisters that God sent his son Jesus the Christ to show us how to live. Might Paul have been writing this to the Beloved Community? I hope this letter finds you strong in the faith. …..
Yours for the cause of Peace and Brotherhood. Sister Paul Teresa Hennessee, S.A. is a Franciscan Sister of the Atonement. She worked nine years with the Graymoor Ecumenical and Interreligious Institute serving as an Associate Director working primarily the African American comunity. Sister was appointed by Cardinal Walter Kasper to the World Council of Churches' Education and Ecumenical Formation Commission and served seven years in that position. She also served as Interim Director of the Faith and Order Commission of the National Council of Churches. Presently Sister’s ministry continues in Ecumenical Spiritual Direction.